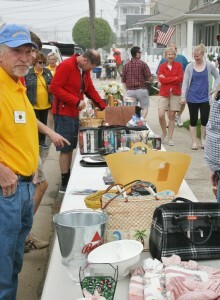 Spring Kickoff Weekend: Yard Sale, Bike Auction, Plant/Hoagie Sale, Paper Shredding Day, More! The Borough of Avalon will bring in spring during the weekend of Friday-Saturday, May 10th and 11th with a host of annual events throughout the community. They include the Avalon Chamber of Commerce’s annual Wine and Spirits Festival, the Avalon Garden Club Yard Sale, the Avalon Lions Club Yard Sale, the Borough’s annual Community Paper Shredding Day, the Avalon Volunteer Fire Department’s Plant and Hoagie Sale, and the Avalon Police Department’s bicycle auction. The fun begins on Friday evening, May 10th, with the Avalon Chamber of Commerce’s annual Wine and Spirits Festival to be held at Avalon Community Hall from 6:30-9:00pm. There will be live entertainment with “Black Dandelion”, and more than 200 wines, flavored vodka, scotch, bourbon and more will be available for sampling. Tickets are $50 in advance, and $60 at the door. Additional information can be found at www.visitavalonnj.com. On Saturday, May 11th, the Avalon Garden Club holds its annual community-wide yard sale throughout the community with dozens of property owners selling various merchandise. The event starts at 9:00am; a free map of all of the properties involved in the yard sale is available at 8:00am at Avalon Community Hall. The Avalon Lions Club will also hold a yard sale located at the Helen L. Diller Vacation Home for Blind Children at 127 26th Street. That sale also begins at 9:00am. The Avalon Volunteer Fire Department will hold its annual plant sale at the firehouse starting at 8:00am at 31st Street and Dune Drive. At 10:00am, the Department will also hold its annual hoagie sale. The Avalon Department of Public Works will host a free Community Paper Shredding Day, beginning at 9:00am. Property owners can visit the Public Works yard to have their paper shredded for free; the paper is then converted into a recycled product. Public Works will also host the Avalon Police Department Bike Auction at 12 Noon with the police department serving as auctioneers.